In cooperation with the Austrian Federal Ministry of Education, and together with the little reading robot Hiro, the Austrian Bookclub invites all Austrian educational institutions to join the initiative Lese-Schaufenster (A Shop Window for Books) for the school year 2017/2018. 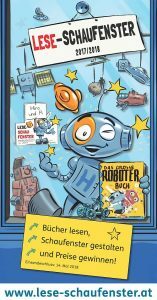 School classes, Kindergarten and library groups will choose among the list of the latest books for children and young people that are recommended by the Buchklub. For one or several of these books, they will create inventive shop windows, showing the content and the quality of the books read. Each Lese-Schaufenster should present one book. In the Reading Month April 2018, the Shop Windows for Books will be created in public spaces or within the schools or libraries, and then be presented online at www.lese-schaufenster.at. The best Shop Windows for Books will be awarded prizes! Visit our website and join us at at www.lese-schaufenster.at!